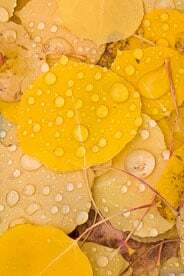 Golden Aspen Leaf Collage with Raindrops - Freshly fallen golden aspen leaves are covered with raindrops along Aspen Ridge outside of Buena Vista, Colorado. 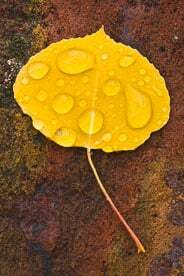 Golden Aspen Leaf on Red Rock - A single golden aspen leaf covered in raindrops lays on a red rock outside of Buena Vista, Colorado. 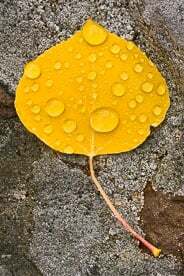 Golden Aspen Leaf on Lichen Covered Rock - A single golden aspen leaf covered in raindrops lays on a lichen covered rock outside of Buena Vista, Colorado. 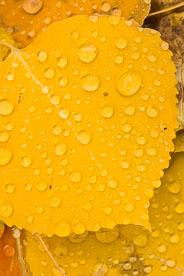 Golden Aspen Leaf Collage with Raindrops #2 - Freshly fallen golden aspen leaves are covered with raindrops along Aspen Ridge outside of Buena Vista, Colorado. 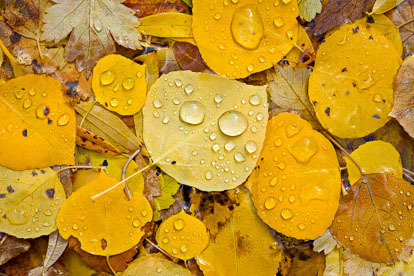 Golden Aspen Leaf Collage with Raindrops #3 - Freshly fallen golden aspen leaves are covered with raindrops along Aspen Ridge outside of Buena Vista, Colorado. 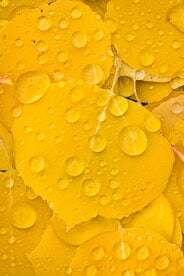 Golden Aspen Leaf with Raindrops Detail - Freshly fallen golden aspen leaves are covered with raindrops along Aspen Ridge outside of Buena Vista, Colorado. 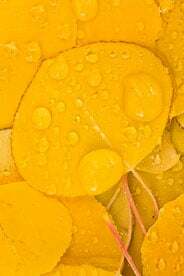 Golden Aspen Leaf Collage with Raindrops #4 - Freshly fallen golden aspen leaves are covered with raindrops along Aspen Ridge outside of Buena Vista, Colorado. 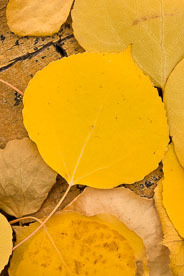 Golden Aspen Leaf Collage #1 - Fallen golden aspen leaves along Aspen Ridge outside of Buena Vista, Colorado. 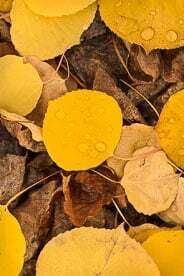 Singled Out - A golden aspen leaf covered in raindrops lies amid older brown leaves along Aspen Ridge outside of Buena Vista, Colorado. 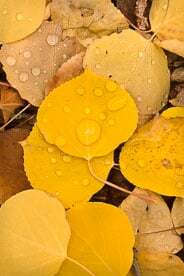 Golden Aspen Leaf Collage with Raindrops #5 - Raindrops on fallen golden aspen leaves along Aspen Ridge outside of Buena Vista, Colorado. 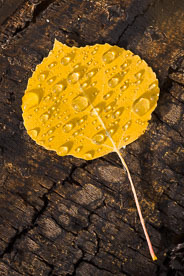 Golden Aspen Leaf on Log - A single golden aspen leaf covered in raindrops lays on a log outside of Buena Vista, Colorado. 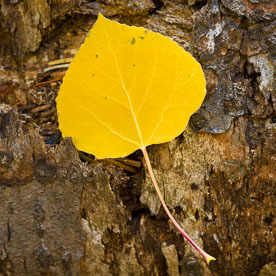 Golden Aspen Leaf on Bark - A golden aspen leaf lays on aspen bark along Aspen Ridge outside of Buena Vista, Colorado. 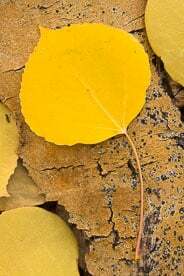 Golden Aspen Leaf Collage #2 - Fallen golden aspen leaves lie on aspen bark along Aspen Ridge outside of Buena Vista, Colorado. 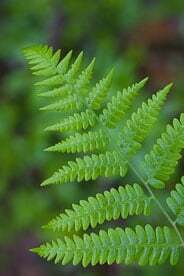 Acadia Fern - A gently curving fern in Acadia National Park, Maine. 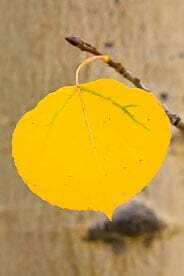 Maple Leaf Collage - A lone red maple leaf rests in a pile of fallen leaves in Spring Creek Canyon outside of Kanarraville, Utah. 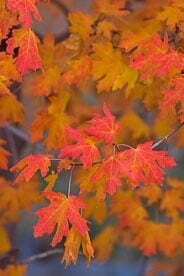 Maple Magnificence - A red maple tree in full fall slendor In Zion National Park, Utah. 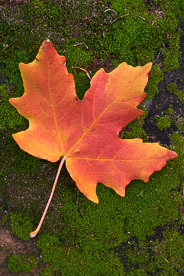 Maple Leaf on Moss - An orange maple leaf rests on a mossy rock in Zion National Park, Utah. 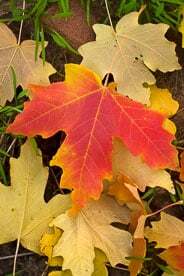 Brilliant Maple Leaf - A brilliant red maple leaf rests among others on the ground in Zion National Park, Utah. 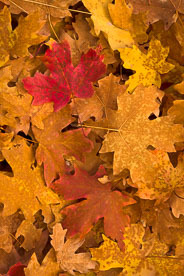 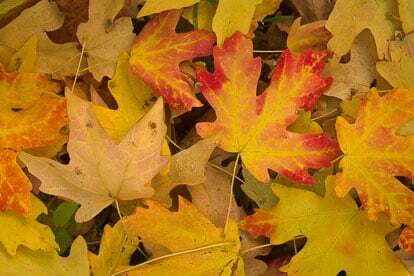 Forest Floor Collage - Multicolored maple leaves rest on the forest floor in Zion National Park, Utah. 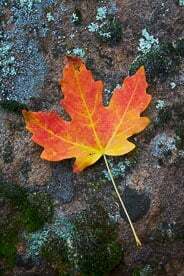 Maple Leaf on Rock - An orange maple leaf rests on a rock in Zion National Park, Utah. 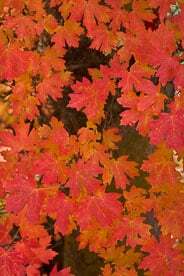 Autumn Ablaze - A bough of brilliant red maple leaves in Zion National Park, Utah. 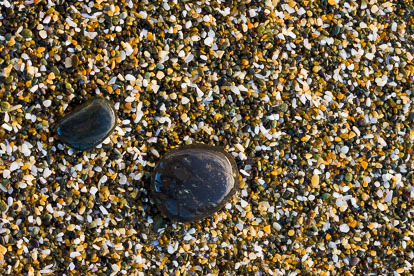 Polished Pebble Pair - A pair of polished pebbles lay in the coarse rocky sand outside of Riverton on the South Island of New Zealand. 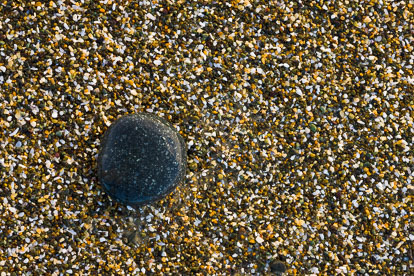 Smooth Pebble - A polished pebble lays in coarse rocky sand outside of Riverton on the South Island of New Zealand. 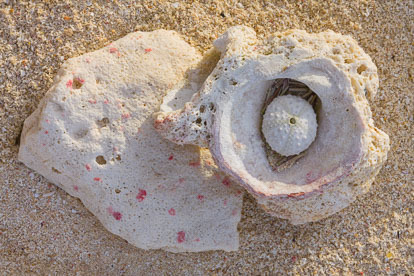 Out of the Sea - A sea urchin shell rests in a collection of coral on a white sand beach in Anguilla. 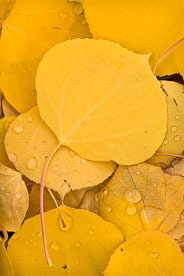 Late Bloomers - The last flowers of summer are surrounded by golden aspen leaves outside of Ridgway, Colorado. 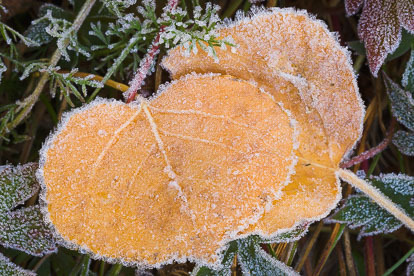 Frostbite - Fallen aspen leaves with a heavy frost cover outside of Ridgway, Colorado. 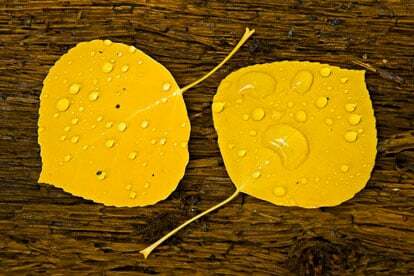 Aspen Leaf Twins - A pair of golden aspen leaves rest on a rain soaked log outside of Ouray, Colorado. 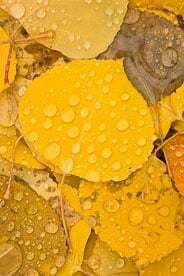 Fall Leaf Collage - Water droplets from an afternoon fall rain shower cling to a collection of fallen golden aspen leaves outside of Ouray, Colorado. 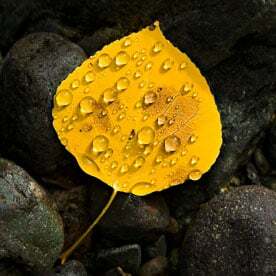 Rain Dappled Aspen Leaf - Rain drops cling to a golden aspen leaf laying streamside outside of Ouray, Colorado. 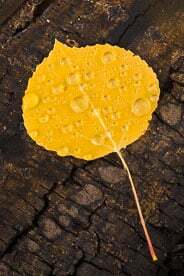 Golden Aspen Leaf on Bark - The bark of a fallen tree hold a golden aspen leaf outside of Steamboat Springs, Colorado. 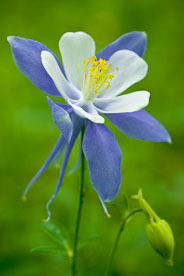 Blue Columbine - A graceful columbine bloom outside of Granite, Colorado. 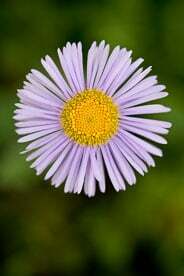 Violet Aster #1 - Violet aster bloom near Vicksburg, Colorado. 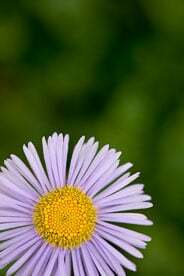 Violet Aster #2 - Violet aster bloom near Vicksburg, Colorado. 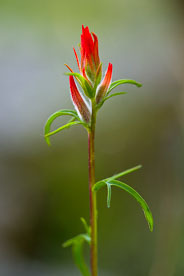 Lone Paintbrush - Bright red paintbrush bloom near Vicksburg, Colorado. 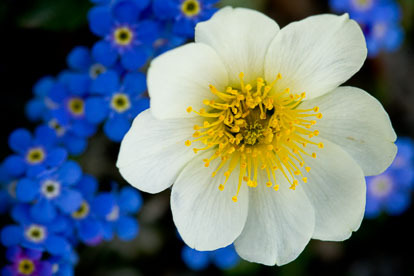 Alpine Flower Bouqet - A Mountain Dryad blooms among Alpine Foget-Me-Nots at the top of Cottonwood Pass in Colorado. 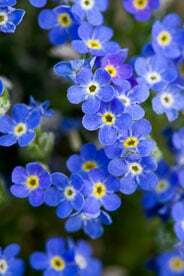 Alpine Forget-Me-Nots - A bunch of tiny Alpine Forget-Me-Nots at the top of Cottonwood Pass in Colorado. 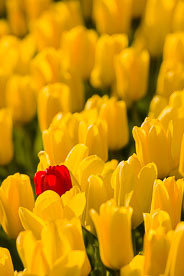 Lone Red Tulip - A lone red tulip stands among a field of yellow tulips in Skagit Valley, Washington. 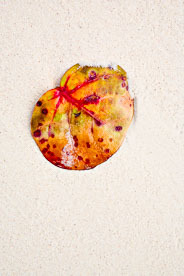 Sea Grape Leaf and White Sand - A colorful sea grape leaf washed up on the white sand beach in Anguilla, BWI. 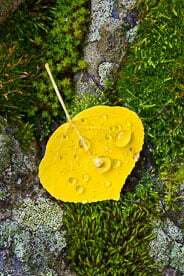 Aspen Leaf on Moss Rock - A golden aspen leaf covered with raindrops lies on a moss covered rock outside of Aspen, Colorado. 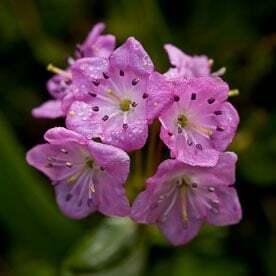 Miniature Flower Bouquet - A tiny bunch of pink alpine wildflowers near Dream Lake in Rocky Mountain National Park. 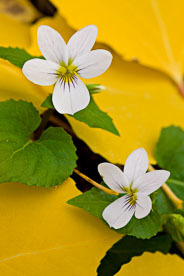 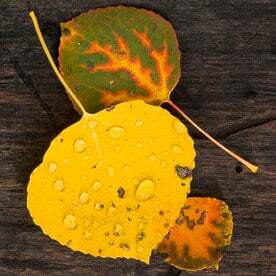 Aspen Leaf Trio - A colorful trio of aspen leaves lay on a log outside of Crested Butte, Colorado.